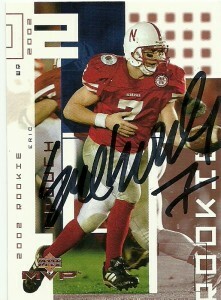 Eric Crouch is a hometown football hero, playing for the Nebraska Cornhuskers, and winning the 2002 Heisman Trophy. There he became as well known for his passing, as he was for his rushing, out of the wishbone offense. He set numerous records there including the career touchdown leader with 88, most TDs rushing by a QB with 59 (NCAA record), and the school’s career total offensive yardage leader with 7915 yards. He also became one of 3 quarterbacks to rush for over 3000 yards and pass for over 4000. Draft pundits were unsure of the final position he should play, but overall he was generally regarded as a well rounded athlete. The Rams drafted Eric in the 3rd round of the 2002 draft to play receiver, but with his heart not in the position change, Eric packed his bags. Later he’d resurface on the roster of the Packers from 2003-2004, and the Chiefs in 2005. Eric then took a stint to play in the NFLE with the Hamburg SeaDevils in 2005. There he played free safety notching 25 tackles and 2 passes defensed. Returning across the pond, Crouch went to play for the Toronto Argonauts of the CFL in 2006. There he’d finally be taken seriously as a quarterback, where he could hone his skills. He completed 6 of 13 passes, for 127 yards, and a pick. The next season, Crouch was expected to compete for the second string job, but injuries derailed his CFL career, and he’d be released midway through the 2007 season. A new league, the AAFL (All American Football League) appeared in 2008 with teams scheduled to play in 6 markets. The league hastily put a draft together, and Eric Crouch was the 3rd overall pick by Team Texas, coached by former UH coach John Jenkins. Unfortunately the AAFL never took to the field due to ‘softening financial markets’. With Eric’s rights released, he decided to give an open tryout a shot with the UFL’s Omaha Nighthawks. He signed with the team in June of 2010, and played during the regular season, but in a September contest suffered a torn miniscus, ending his career. He’s currently retired and lives in Nebraska with his wife and 2 children.